Through this portal you will enter the Wizarding World at Universal Studios. Florean Fortescue's Ice Cream Parlor is amazing. This particular flavor is called Butterbeer. It was very smooth and extremely yummy. More of Diagon Alley. This is the covered portion of the area. This area becomes very popular when a random rain storm pops up. Inside the Magical Menagerie store. Inside Borgin and Burkes which is located in Knockturn Alley. Radio Station on the right and a chandelier store straight ahead. The Leaky Cauldron is the main restaurant in the area. Ollivander's features a wand choosing show and then a shop for purchasing wands. Here you can purchase cauldron cakes, a pumpkin pasty, and even Butterbeer fudge. 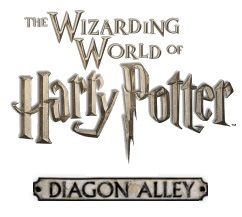 The main attraction in Diagon Alley is Harry Potter and the Escape from Gringotts. This multi-dimensional roller coaster ride is amazing. We seriously could spend all day in Diagon Alley. On the way out of the area, look up and you can see the Leaky Cauldron Inn. Just outside the area you can visit the Knight Bus. This door belongs to 12 Grimmauld Place. Every so often you can see Kreacher peeking out the window of Sirus Black's home. At night Diagon Alley becomes even more magical.